Welcome to the New York Peruvian Film Showcase, a celebration of modern Peruvian cinema’s exhilarating fifty-year journey. 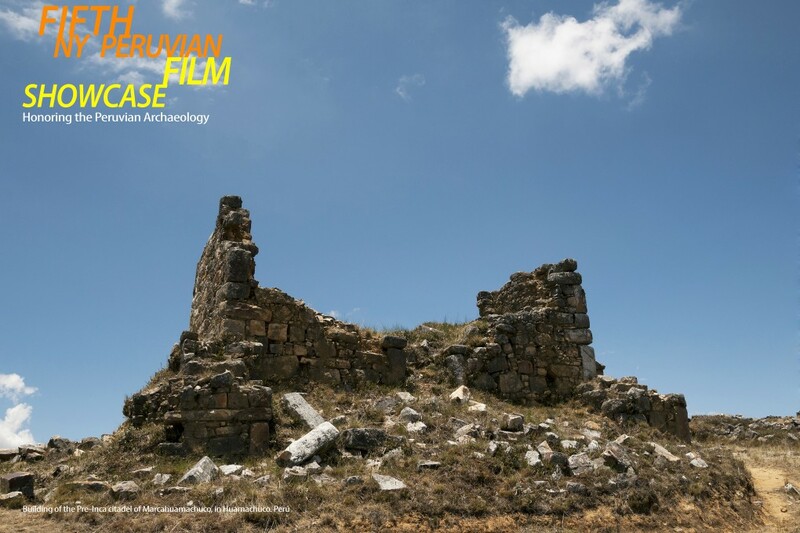 This year, the program is dedicated to Peruvian archaeology, as portrayed through cinematography, video art, science, literature, and music. Peru, a vibrant multicultural country with a varied, abundant and rich cultural heritage, boasts a stunning archaeological legacy that includes such unique sites as the citadel of Caral, which dates back more than five thousand years. This legacy is present in the daily life of the populations: pre-Columbian temples, or huacas, dot the urban landscapes, royal tombs are unearthed on a regular basis, and ancient Peruvian art forms still influence and inspire present generations. This celebration of Peru’s historical legacy will showcase 13 films from the last 50 years, including documentaries, shorts, video art, and feature-length fiction, as well as an homage to the life and work of our great friend and filmmaker Roberto Guerra, who left us this past January, 2014. The 5th Edition of the New York Peruvian Film Showcase is directed and produced by the photographer and filmmaker Lorry Salcedo Mitrani, in collaboration with the Permanent Mission of Peru to the United Nations in New York, the Wiese Foundation, and with the generous support of Mr. Guzman Aguirre Altamirano, Ms. Martha Meier Miro Quesada, Mrs. Ana Maria Estrada de Rosen and Mr. Carlos Sandoval de la Cruz, President of the Regional Government of La Libertad. Additional support has been provided by Susana Mitrani, Marco Palomino Pezo, Javier Iturralde de Bracamonte, the Center for American Studies in Lima (CEA), Santa Maria Hotel in Huamachuco, Cerveza Cusqueña and Backus Corporation. Award ceremony: The Backus Corporation Award for Lifetime Achievement and Contribution to the Art of Cinematography. (Los Heraldos Negros), (3’), a poem by Cesar Vallejo. Excerpt from the documentary Che, a new man (Che, un hombre nuevo) (2010) by Tristan Bauer. (El Mudo) (1:30’) Feature-length film by Daniel y Diego Vega (2014). Was it a stray bullet or a botched assassination attempt that left Constantino mute? Fernando Bacilio delivers a stunning performance as an obsessed magistrate who goes beyond the bounds of his powers to get answers. Diego and Daniel Vega combine deadpan existentialism, political satire, and slow-burning mystery for a winning combination. The plot is tantalizing: as in classic movie mysteries like The Conversation and Blow-Up, the uncertainty extends beyond the criminal’s identity to the very nature of the crime itself. Reception hosted by the Mission of Peru to the United Nations. Archaeology and Art. (Films Presentation by Fortuna Calvo-Roth). This documentary tells the story of an astonishing discovery: the well-preserved body of a young woman with tattooed arms and legs, buried along with symbols of power previously only found at the burial sites of high-ranking men. The mummy turned out to be the Lady of Cao of the Moche Culture on the northern coast of Peru, first woman ruler in the pre-Columbian world. Spanish dialogue with English subtitles. The Huamachucos were a pre-Hispanic culture who inhabited the northern highlands of Peru between the fifth and eleventh centuries A.D. The finest example of this culture’s architectural sophistication may be seen in the citadel of Marcahuamachuco. This story introduces us to the past and present of the Huamachuco culture. (15’) Documentary by Fernando Elorrieta y Edgar Elorrieta (2009). Excerpt from the documentary Cusco and the Sacred Valley of the Incas (Cusco y el Valle Sagrado de los Incas) (48’). Machu Picchu needs no introduction, but the focus of this gorgeous documentary by the Elorrieta brothers is directed elsewhere. Here, they show us the stunning Inca citadel from an archaeo-astronomical perspective, helping to unlock the mysteries hidden inside this magical site. This experimental video brings to life and infuses current relevance into a colonial painting that captures a crucial moment in history: the execution of the last rebel, Inca Tupac Amaru (born Jose Gabriel Condorcanqui, Tupac Amaru II), and the political wedding of his niece, Beatriz Clara Coya, to a Spanish army captain—events that consummated the Spaniards’ conquest of the Inca empire and the official fusion of Peruvian and Spanish cultures. Cesar Calvo, one of the great contemporary Peruvian poets and a member of the so-called Generation of the ‘60s, was one of those people who leaves deep impressions behind when they are gone. Thanks to his poetry, dazzling and moving, refined and musical; his work in prose, in which he highlights his love for the Amazon jungle, whose worldview he depicted masterfully; and an irresistible personality that led him to live each day as if it were his last, he has now become a legend. In this black comedy, Fausto and Ofelia return to their native Peru after 30 years away. They are faced with the reality of a country that has changed over all this time, and are now dealing with the idea of getting Alzheimers’s. Fausto meets Jaime, a hustler, and their whole life is changed. Dioses presents us with a dysfunctional family who lives in a seemingly perfect world: the exclusive beaches to the south of Lima, where the city’s upper class spends each summer. Agustin, the father, is a prosperous businessman who is just starting out on a new life with Elisa, his new fiancée, twenty years his junior and the product of a more humble social background. Andrea, the eldest daughter, is a successful model who seems to have it all, but she also has something to hide. Diego, the youngest child, is a teenager tormented by guilt over his secret infatuation with his sister. A story of decadence, hypocrisy, and conformism in a frivolous, self-interested environment, where each of the characters acts as if they were a god: beyond rules, beyond morals, beyond belief. (El Azaroso Camino de la Fe de Otto Brun) (50’) Documentary by Grupo Chaski (2013). In 1972, a young Swiss priest named Otto Brun settled in Peru, leaving behind a Catholic mother, a strict father, and a Europe still in turmoil after May of ‘68. He arrived in pursuit of the ideas of “Liberation Theology,” which he had heard about at a conference in Madrid, and whose impact would lead him to question the very core of what it means to be a priest: How can one be a Christian on such an oppressed continent? What could he do to make faith into an instrument of liberation? wondered Otto. His allegiance to the cause would have a severe impact on his daily life. He was persecuted by the upper hierarchy of the Catholic Church, receiving threats and reprimands. But none of these pressure tactics could dissuade him from his faith or his mission to help society’s dispossessed. Until he fell in love with his assistant and decided to leave behind his priest’s robes to get married. (18’50”) Fiction short by Claudia Llosa (2011). The lives of three people in search of redemption intersect in the streets of Lima: undercover cop Gamarra’s desperate attempts to save his wife from a terminal illness get him into trouble; bus driver Felix wants to be accepted into a religious sect after his involvement in a tragic traffic accident; and Narciso, the imperiled leader of a soccer team fan club, tries to secure his younger brother’s release from prison. El Evangelio de la Carne does for Lima what Amores Perros did for Mexico City, presenting a complex portrait of a socially and financially precarious world. Posted on July 21, 2014 September 19, 2014 by NY Peruvian Film Showcase	Bookmark the permalink.